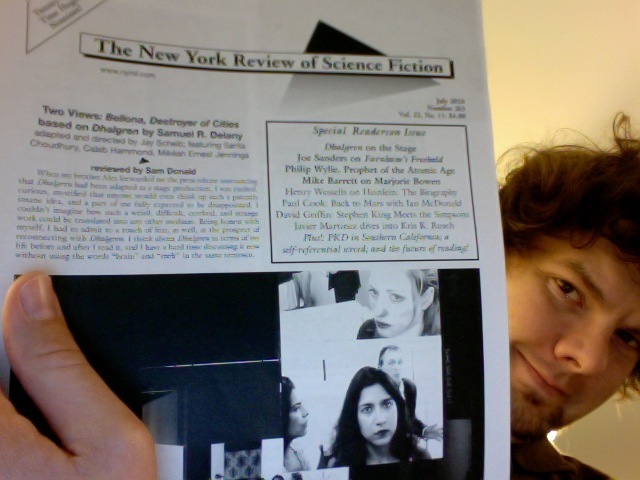 Do You Subscribe to The New York Review of Science Fiction? Do you subscribe to The New York Review of Science Fiction? I was gifted a subscription, and it has been wonderful having the NYRSF to read again after a few years of graduate school induced hiatus. The NYRSF’s contributors have an exciting tone with teeth that dig at the meat of science fiction. Issue #263 has essays by Joe Sanders, Richard L. Kellogg, and Mike Barret, and it includes reviews on Bellona, Destroyer of Cities, based on Delany’s Dhalgren (two separate reviews on this one), Ian McDonald’s Ares Express, Stephen King’s Under the Dome, William H. Patterson, Jr.’s Heinlein biography, and Kristine Kathryn Rusch’s Diving Into the Wreck. If you aren’t a subscriber, you should sign-up now at the official website here.